I have been working in veterinary practices since 1999 and qualified in 2004. I have worked at Twickenham Veterinary Surgery since November 2009, after taking a year out of veterinary nursing to go travelling. 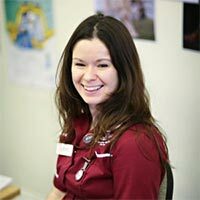 I enjoy working with animals and their owners and particularly enjoy developing the nurse clinics. My interests are geriatrics, feline behaviour and nutrition. Outside of work, I am a keen runner, mummy and shopaholic! I came back to the surgery part time following the birth of my first son, Stanley, on 6th November, 2014. I am currently on maternity leave following the birth of my second son, Eddie, on 10th March, 2017, and I am enjoying getting to know him.